Experience eating like a local. Dive into the local cuisine and you'll find another reason to love Hawaii. Here's our insider guide to local flavor you should taste when you're here. Mainlanders are afraid of Spam. But, it's good! Really! Here in Hawaii this salty mystery meat is a staple of the local diet. During World War II, when fresh meat was in short supply, civilians stocked up on the ration well known to GIs. Spam musubi is now snack supreme at delis and 7 -Elevens islandwide. So what is a spam musubi? 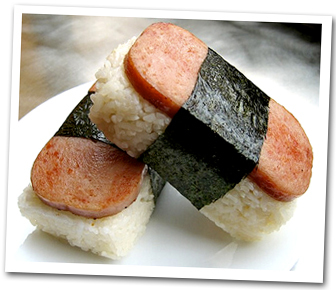 A nice thick piece of spam is typically fried in a mixture of sugar and soy sauce, placed on top of a molded block of white rice and wrapped in nori (dried seaweed). Residents love Spam so much we have an annual festival named the Spam Jam right here in Waikiki. Grab one hot out of the warming oven at an ABC Store for a grab and go snack. After a day at the beach you'll be hooked! Hawaii's sizable Asian influence is evidenced by much of the islands' cuisine. This term is used quite frequently in Hawaii. 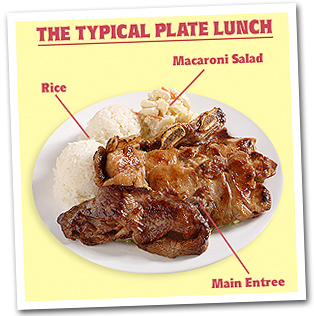 A mixed plate lunch is a boxed lunch usually consisting of two scoops rice, one scoop macaroni salad and then the main meat on top, barbecue chicken, chicken katsu, beef stew, kalbi ribs (Korean short ribs) or other options. This term and concept was started in Hawaii's plantation days when workers of different ethnicities would share each other's meals to create plate lunches with food from many different ethnicities into one plate of delicious local variety. There are countless diners and fast food restaurants and shops open where you can grab a plate lunch. We love the plates at L & L Hawaiian BBQ. 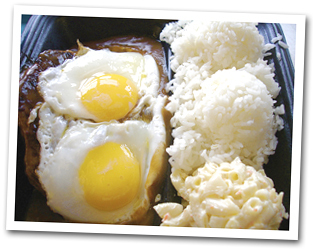 This tasty, popular dish is made with a hamburger, rice and brown gravy topped with a fried egg. Unique to Hawaii, there are many variations with fish, Spam, Portuguese sausage and other meats. This filling mighty meal was created on the Big Island in the late 1940's. It is said that the name came from a frequent teenage diner of the restaurant who impressed with the hefty portions called it "loco” which means crazy and "moco” because it rhymed and sounded nice. You will find this local legend at most fast food plate lunch restaurants. Our favorite is at Zippy's a local restaurant that serves all kinds of Hawaiian and local food. A noodle soup dish inspired by Japanese ramen, Filipino pancit, and Chinese mein. 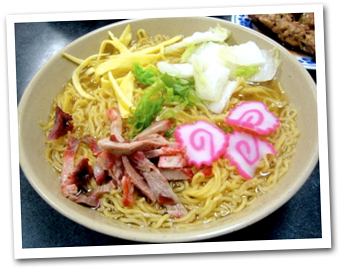 Developed during Hawaii's Plantation era, unlike ramen, saimin noodles contain eggs. You will often find green onions, spam, kamaboko (steamed fish cake), char siu (roast pork) or gyoza (Japanese pot stickers) as accoutrements to your bowl of saimin. Can't beat the saimin at Zippy's - they have fresh noodles every day! Looks like a snow cone but compared to our local version the taste is nowhere close. The shave ice is so fine that flavors meld with the ice rather than settling to the bottom of the cup as with a snow cone. Like a soft, powder of ice that comes in a rainbow of flavors. Thereês the standards such as Cola, Strawberry, Banana, Bubble Gum and Vanilla but you must try Lilikoi (passion fruit), Haupia (Coconut) with Li hing mui (powder made from dried and salted plums). The flavors don't stop there because at shave ice stands you can often customize it to add mochi balls (sweet chewy dessert balls made from rice) or azuki beans(sweet red beans) or ice cream or sweetened condensed milk or add them all for a colossal treat on a sunny day. Perfect for ending a hike or after a great day at the beach. You can find shave ice in Waikiki and the North Shore area at shave ice stores. 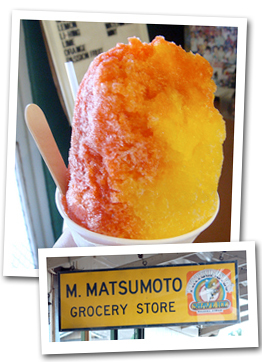 Hands down, our favorite is the super popular and famous Matsumoto's Shave Ice in Haleiwa. It's a hike to get there from Waikiki and the lines are crazy long, but after a long day on the North Shore this shave ice is awesome - Lychee and Banana with ice cream - YUM! Malasadas are a local Portuguese dessert that can be described as a softer, chewier version of a donut without the hole. They were first made by inhabitants of St Miguel Island, part of the Azores. In 1878, Portuguese laborers from the Azores came to Hawaii to work in the plantations and brought their traditional foods with them including this deicious confection. 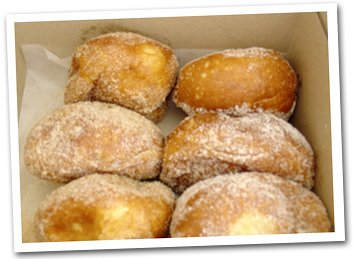 Today there are numerous bakeries in the islands specializing in malasadas. The dough is scooped up with ice cream scoopers and then deep fried and coated with sugar. They are a local favorite for parties and breakfast. Originally without fillings, you can now try this delightful treat with custard, chocolate, haupia (coconut) and even guava fillings.